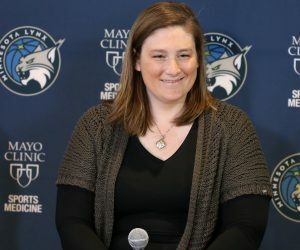 The Minnesota Lynx look to continue their hot start to the season when they take on the Washington Mystics on Friday night in the nation’s capital. The Lynx come into the game at 7-0 overall and are the top team in the Western Conference. The Mystics enter at 6-2 and are in first place in the Eastern Conference. 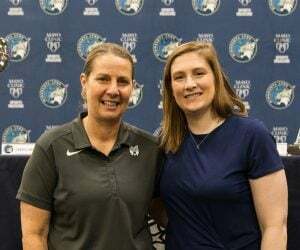 Lynx guard Lindsay Whalen can become the WNBA’s all-time leader in wins in the game. Whalen enters the game tied with Swin Cash with 294 career wins. The game features two players who are in the top five in scoring in the WNBA. Minnesota’s Sylvia Fowles is third with 20.9 points per game, while Washington’s Elena Delle Donne is fourth with 20.6 points a game. The Lynx and Mystics are two of the top offensive teams in the league. Washington ranks second with 84.5 points game, while Minnesota is third with 84.4 points per game. Minnesota is coming off of a 100-77 win over the Seattle Storm on Saturday in Seattle. Fowles had 26 points and seven rebounds to lead the way. 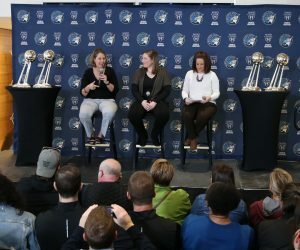 Rebekkah Brunson had 21 points and four rebounds, Whalen had 19 points, five assists and four rebounds, Seimone Augustus had 13 points and seven rebounds and Maya Moore had six points, four rebounds and four assists for the Lynx. Washington is coming off of a 101-89 win over the Dallas Wings on Tuesday in Arlington. Delle Donne had 23 points, six rebounds and four steals to lead the Mystics. Tayler Hill had 17 points and four assists, Kristi Toliver had 17 points, Krystal Thomas had 10 points and eight rebounds and Ivory Lata had 10 points off the bench. Minnesota and Washington squared off on May 8 in a preseason game at Verizon Center in Washington D.C. 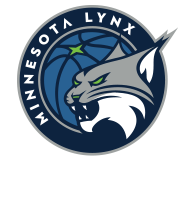 In that game, the Lynx came away with a 74-59 victory. Brunson led the way for the Lynx in the game with 14 points and seven rebounds. Fowles had 11 points and five rebounds, Natasha Howard had 11 points and six rebounds, Temi Fagbenle had eight points and Whalen added six points and five assists. For the Mystics, Tianna Hawkins had 14 points and seven rebounds. Natasha Cloud had 11 points and three assists and Tierra Ruffin-Pratt had nine points and three rebounds. Minnesota, which held a 2-1 season series advantage over Washington last year, will square off against the Mystics three times this season. One key matchup will come at the forward position between Minnesota’s Rebekkah Brunson and Washington’s Elena Delle Donne. Brunson is coming off of a dominant performance against Seattle, tallying a season-high 21 points, four rebounds and two assists. She is averaging 10.7 points, 6.4 rebounds, 1.6 assists and 1.2 steals per game this season. Delle Donne is off to another stellar season in her first year in Washington. 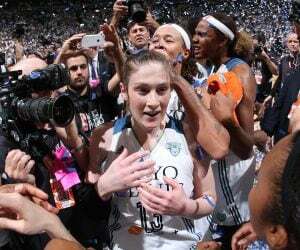 The 2015 WNBA MVP is averaging 20.6 points, 7.3 rebounds, 1.6 blocks, 1.3 assists and 1.2 steals a game this season. Washington: Natasha Cloud (knee) is questionable. Emma Meesseman (personal) is out. Minnesota: No injuries to report.